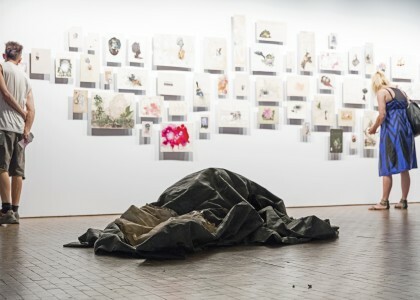 For the 10th Berlin Biennale, Oscar Murillo has created an installation involving the industrial process of baking bread, evoking ideas around consumption and a basic sustenance of life. 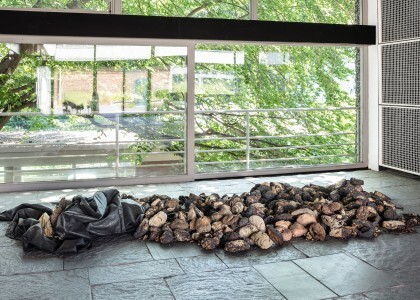 In the courtyard of the Akademie der Künste, Murillo has set up a number industrial ovens which produce rock-like loaves made from a mixture based on corn and clay, recurring organic materials in the artist’s practice. 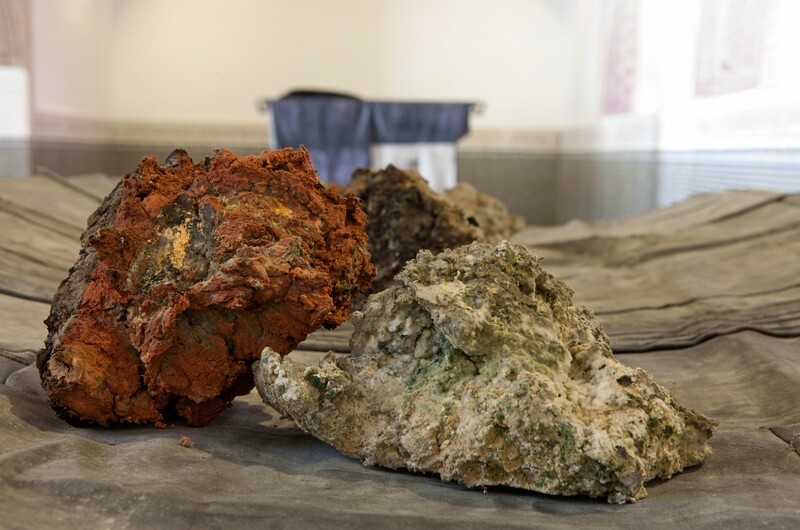 Here, the baked “stones” are heaped in piles and then stuffed inside large sculptural intestine-like forms made from naturally colored fabrics, onto which coins from different parts of the world are sewn. 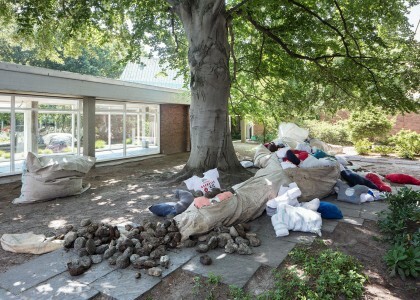 These lumpy, long cloth sheaths containing the loaves are distributed around the institution, offering surprise encounters with what resembles a state of maldigestion. These intestine-like forms also resemble decaying, open bodies that are waiting to be devoured by vultures. Sometimes the intestines are inserted with stuffed cloth forms shaped like human torsos, which in turn wear garments inscribed with worker’s slogans and maps indicating the trade routes of different food products. These references to the human body point to the violence inherent to the daily, routine flow of thousands of workers into factory spaces. These paths, which Murillo has likened to those leading into a slaughterhouse, reflect the normalization of aggression through labor.